Product information for Mechanical fittings renewal,News,Rockpower - Fluid Handling Equipment and Machine Parts. 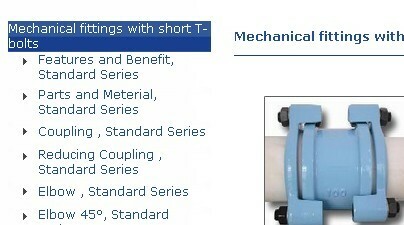 The product information for Mechanical fittings with short T-bolts,Standard series updated. Mechanical fittings with short T-bolts are designed for a wide variety of plain-ended pipes connection, no more need on-site threading or welding, just push on the pipe and tighten the short T-bolts, the fittings will form an effective permanent leak tight joint. Mechanical fittings with short T-bolts includes Standard series and Steel lock series. The Standard series of Mechanical fittings with short T-bolts (all data and drawings updated this time) are designed to suit specified outside diameter tailored to your particular needs.